Most innovative businesses provide rewards and some form of recognition to inventors. There are two main reasons for having a reward and recognition program in place for inventors. Firstly in certain jurisdictions there are legal requirements to take into consideration. Secondly and more importantly, a good comprehensive reward and recognition program encourages and motivates innovation and creativity. The components of a reward and recognition program may include such elements as financial awards, plaques, patent festivals or celebrations, all giving the inventor recognition by Senior Management. Additionally top inventors can be recognized with exclusive get-togethers and published of league tables of the top inventors within the organization. The value of a simple ‘thank you’ or ‘well done’ should not be overlooked. More than 80% of inventions are made by employees and it is therefore important that the company is aware of its rights with regard to an invention, as well as the rights of its employees. The general rule is that where an employee creates an invention in the course of his employment, this invention and any patent will belong to his employer. However, there are statutory provisions in place to ensure that the employee does not go unrewarded. Japan and Germany are two examples of jurisdictions where employee compensation is common, but there are others. The decision to deploy an inventor award program seems straight forward enough. However, implementing such a program is easier said than done. Prior to launching any such program, some key issues need to be considered and thought through. What is the actual inventor award amount to be paid? How has this been calculated? How does the amount compare and contrast with competitors? Does the company have employees in jurisdictions with inventor award legislation? Is the award per invention (most common approach) or per inventor, as a percentage of inventions will have more than one inventor named? Or is some hybrid approach to be taken, e.g. When is the award to be paid? What stage of the patenting process has to be reached to trigger an inventor award? Is the award to be a one off payment or paid out in at key milestones, e.g. If the award is to be paid out at key milestones, then what are the award payments to be made at each milestone? Is the amount to be paid the same for every invention / patent or does it vary depending on the rating or importance of the invention / patent? Is there a financial award to be paid out for other outcomes other than filing a patent (e.g. publishing the inventive idea, keeping it as a trade-secret)? Is there any flexibility to adjust the pre-determined award payment for special cases, and if so, what qualifies as a special case? Are awards to be paid to employees who have since left the company, and if so, how are these people to be located? Are inventor awards to be paid to student interns, to subcontractors and/or to collaboration partners (i.e. non employees)? Who in the company is responsible for administrating the inventor award program? 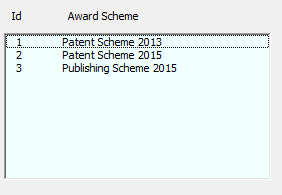 How are award payments communicated to the inventor(s)? From whose budget is the inventor award to be paid? How is the company to keep a track of who is due to be paid plus when payments are outstanding and over-due? Does the company have some mechanism for monitoring total award payments for financial management purposes? Although the focus of this particular paper is on the financial award, an inventor reward and recognition program should ideally include other forms of employee recognition and not just financial payments. These recognition program may include such things as pins, plaques, luncheons, and annual award dinners. A number of companies hold annual inventor award dinners at each of their major research and development location. One company at least provides special colored employee security badges for recipients of their top inventor milestone awards. Many companies operate inventor newsletters and patent award wall plaques. Some will argue that financial reward programs should not be considered at all, as it is the role of research and development engineers to invent. It should however be noted that putting an invention forward involves extra work for the inventor(s), filling out the invention report, answering questions posed by the patent attorney, reviewing the patent application, writing the invention article for publication (or working with an editor). This is typically work that is not in project plans for getting products/services out of the door. Benchmark data suggests that a number of companies are rewarding their inventors well. Financial awards as well as annual patent ceremonies and such items as plaques for inventors are good well established practices in many companies. Increasingly company wide recognition of the top inventors, for example based on exceeding some threshold for the number of granted patents, is becoming the norm. The correct emphasis should be on changing the culture of how businesses view employee inventors away from “we pay them to invent, that’s their job and they are lucky to have job security” whilst the Board oftentimes award themselves huge performance related bonuses. Instead the business needs to convey that it truly values and appreciates innovation because it is that which drives the company’s success and the inventor should rightly share in that. In my view there should be big bonuses for inventors those ideas generate considerable financial success for the company, so long as there is fair estimation of the value of the invention, and its contribution to the business. Screen shots are taken from the inventor award module of Ash ‘invention capture & review’ tool. « Are Patents Getting Their Mojo Back?